As you may know, DraftSight is a professional-grade 2D CAD software, it lets users create, edit and view .dwg and AutoCAD DXF files. 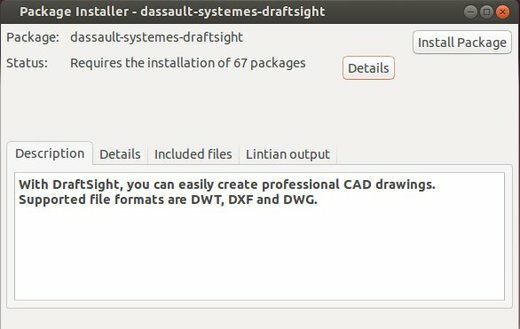 DraftSight website only provides 32 bit version installer for Ubuntu users and this quick tutorial show how to easily install it on 64 bit Ubuntu 13.10 (Also works on Ubuntu 14.04, Ubuntu 13.04, Ubuntu 12.04). To get started, frist install Gdebi from Ubuntu Software Center. 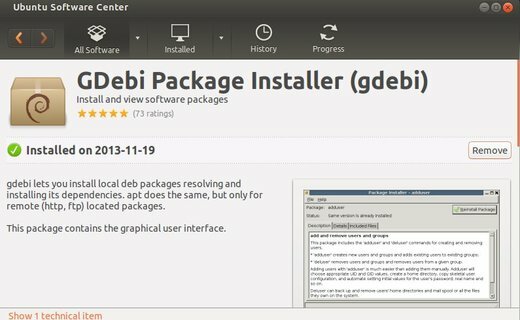 Gdebi is a lightweight DEB package installer which was the default in Ubuntu, it will automatically resolve and install the package dependencies. Right click on the package and select to “open with Gdebi package installer”. Click Install Package button. Once done, you can open DraftSight from Unity Dash. Enjoy! UPDATE: Thanks to Quazaban and isabag, press Ctrl+Alt+T on keyboard to open the terminal. When it opens, run the command below if your DraftSight CAD does not work after this tutorial. I’m brazilian and It was very easy. This really works. Thanks a lot. “Eu sou brasileiro e foi muito fácil. Isso realmente funciona. Agradeço muito”. Hi — got Draftsight installed, and icon shows in Launcher, but won’t launch … anyone have an idea? thanks very much. I follow your suggestion, it worked on intel i3 system (Please look below comment). I repeat the whole steps; gdebi, install libcanberra etc, then install libglu1-mesa:i386, but it does not work for amd a8 laptop. Ubuntu 13.10, 64 bit, lenovo G405S. In Terminal, it says: missing destination file operand after ‘liblu1-mesa:i386″. Hi I’m from Colombia. I’m using Linux Mint Petra. I wasn’t able to make DraftSight worked. After I use the code line “sudo apt-get install libcanberra-gtk-module:i386 libcanberra-gtk0:i386” sugested by Quazaban it runned perfectly, and the program installed flawlessly. Thanks for your feed back. Post updated! Hi, I am from Indonesia. Installing Draftsight was never smooth for me, especially for 64 bit. I use Ubuntu 13.10 on Asus A43E, i3, 2 GB RAM. First try: Ubuntu Software Centre – nothing reasonable happened. Second try: gebi – install, nothing happened. Third try: Follow Quazaban tips – install, Draftsight on Dash, but can not start. Fourth try: Follow isabag tips- voila, Draftsight can be started and used finally. Thank you everybody for the community help. I hope the community spirit persist in Linux community, especially in Ubuntu support community. Just installed Ubuntu 14.04 Gnome Beta 1 and after update I used Gdebi and it didn’t worked, then Quazaban and the install was able but it didn’t lunch. Then used Prashant and started with DS logo, register but didn’t lauch, Ubuntu crashed and tryed to get the details but didn’t worked, even though blocked net conections and need to restart. Wich lib to remove? or any suggest! sudo apt-get install libcanberra-gtk-module:i386 libcanberra-gtk0:i386 libglu1-mesa:i386 and after pack from DS. Phenon x4 8gb ram,gforce 512mb.Ubuntu saucy salamander. Thank you, I’m been trying to make this work for a few days off and on. These were the only directions that worked. It’s worked for me! Thank you so much. I’ve spent days trying to install draftSight in all the various releases of Ubuntu since 12.04 and it’s never worked until today. I thought i was going to have to admit defeat and go back to windows for a decent cad programme. One question, does the latest version of draftSight use the same libraries or am I going to have to go through the whole nightmare again if I upgrade? btw your english is pretty good. I managed to install Draftsight V1.R5 in Ubuntu 14.04. 1. First, install gdebi, from the Ubuntu Software Center, if you do not have it installed before. 4. Open downloaded Draftsight.deb with gdebi. There was some drama in mycase, but do not worry, just follow what gdebi advise you to do, in my case install libaudio2, which must be installed someway around. Again, just follow what was told to you in Terminal. Accept Term and Condition. 5. Draftsight can be started. Gdebi shall be used later, because in my case, it was stuck, when I used it before installing as advised above. I managed to install Draftsight V1R5 in Ubuntu 14.04 following latest procedures hints, in Lenovo G405S, which used to be a problem child in Ubuntu, due to Radeon graphic card model, which is not ‘fully’ supported yet. AMD Ellite Quad Core A8-5550M APU. Tandem graphic cards: AMD Radeon HD 8550G and AMD Radeon HD 8570M. I got even Low Resolution Graphic while installing Ubuntu 14.04 which was a head ache. Great! Draftsight in Ubuntu 14.04! Hello, I just wanna say THANKS A LOT for this tutorial!!!! Really made it simple for me, I just migrated to Ubuntu and know nothing about the whole free software thing! Take care. I have installed on Linux Mint Rebecca 17.1 AMD64 bytes with all libs installs and no problem to run. BUT have you try to open a big file dwg with: impossible to move the 3D view. All my Nvidia openGL GT 630 4 Go vram. drivers are correct, no problem. BUT Draftsight don’t move correctly the view for big file…. The linux release is not ended! A lot of bugs with it!